­­­­The British Standard for slating and tiling now recognises that air permeable underlays can take the place of ventilation in a cold roof – as long as that underlay meets minimum performance standards. Graham Copson, Technical Manager of Klober, explains. To ventilate or not to ventilate: that is the question and it’s one that the industry has been discussing for too many years. The good news is that we now have a definite answer to that question, as contained in the latest amendments to BS 5534, the code of practice for slating and tiling published in February last year (BS 5534:2014 + A2:2018). For the first time, there are minimum air permeability figures included in the Standard for underlays, that allow them to be used without any other ventilation in a cold roof. This is potentially good news for contractors. Pick the right underlay, and there’s no need to spend the time and money on installing additional ventilation at the ridge. Historically, there have been problems with breathable underlays. Around ten years ago, we started to find new homes with breathable underlays on the roof and yet there was condensation in the roof space, running down the underside of the underlay and making rafters and stored possessions damp. We now know that the problem was with the understanding and definition of a ‘breathable’ underlay. We breathe air, so it seems reasonable to think that a breathable underlay lets air through. But this isn’t necessarily so. Just because an underlay is permeable to water vapour, it doesn’t mean that it is permeable to air too. Back in 2010, the NHBC reported problems in unvented roof spaces with vapour permeable membranes – condensation was forming on the underside of the underlay in cold, frosty weather. In 2011, the NHBC added a clause to its standards to say that high-level roof void ventilation should be used when installing vapour permeable roof underlays and the ventilation had to be equivalent to a 5mm continuous slot at or near the ridge. However, the following year, the NHBC made a further clarification. In its Technical Extra 06, published in February 2012, the NHBC said that underlay that was certified as ‘both vapour and air open’ could be used without ventilation, providing that the manufacturer could prove that it enabled ventilation levels equivalent to the 5mm gap. This year’s amendment to BS 5534 goes a step further, setting down a specific value for air permeability: a LR (low resistance to water vapour) underlay must have a water vapour resistance not more than 0.25 MNs/g combined with an air permeability of not less than 20 m3/m2h at 50 Pa. So, for example, Klober’s Permo® air would meet this new definition. It has a water vapour resistance of 0.045MNs/g and when it comes to air resistance, tests at the Building Research Establishment delivered results of 63 m3/m2 hr at 50 pascals. When calculating wind uplift loads, one must consider the effectiveness of the roof substrate – boarding or sarking and/or underlay – as ‘shielding’ the tiles or slates from said uplift. This is referred to as the ‘shielding factor’. If an underlay allows air to pass through, it implies that the ridge and hip tiles will be taking more force from the wind uplift than if the underlay was impermeable (although subject to less force than if there was an open gap). That is to say: it benefits from less shielding. In calculation, the shielding factor is expressed as ‘S’, and the February amendment now sets down what S should be for the various situations. Where a non-ventilating underlay is to be used, factor S would be 0.1. For ventilated ridges (and roofs without underlay) factor S is 1.75 and for roofs with air permeable membranes factor S is 1.5. 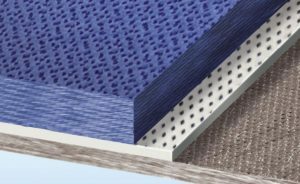 This means that with an air permeable membrane such as Permo® air, fewer fixings are needed than if high-level ventilation had to be incorporated. 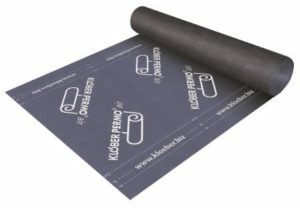 Another important consideration when choosing underlay for cold roofs is how air tight the ceiling below the roof is. The latest amendment to BS 5534 tackles this issue by getting rid of references to a ‘well-sealed ceiling’ and instead defining a ‘continuous ceiling’ as one with 30mm2/m2 or less and a ‘discontinuous ceiling’ as one with more than that figure. 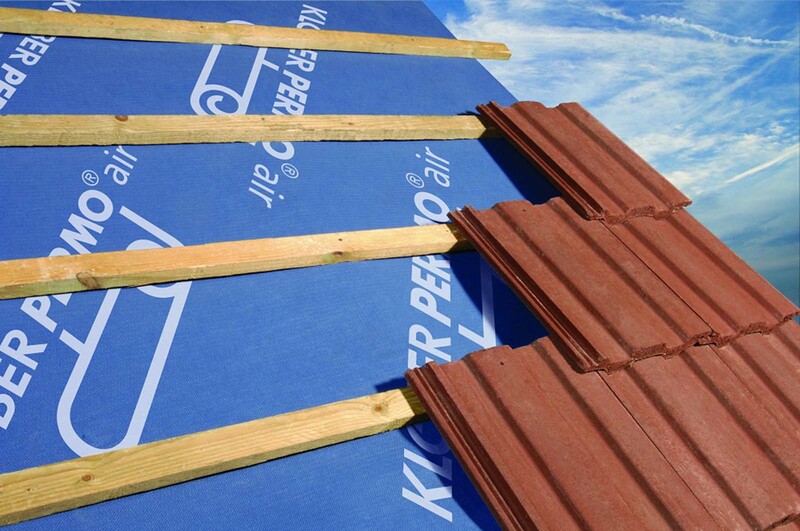 Taking all things into consideration, the choice of a vapour and air permeable underlay is often the right choice for both roofing contractor and the housebuilder. As well as time and materials saved on the roof, this solution means that the house is water tight sooner, with all the positive impacts to you project that this can bring.